A 5 kg ball is lifted from the floor to a height of 1.5 m above the floor. What is its increase in potential energy? An 8 kg ball is moving at 4 m/s. Work is done on the ball to give it a speed of 12 m/s. What is the ball�s initial kinetic energy? What is the ball�s final kinetic energy? What work was done on the ball? A 3 kg object falls from a height of 10 m. What is its velocity just before it hits the ground? An object of mass �m� falls from a height of 10 m. What is its velocity just before it hits the ground? 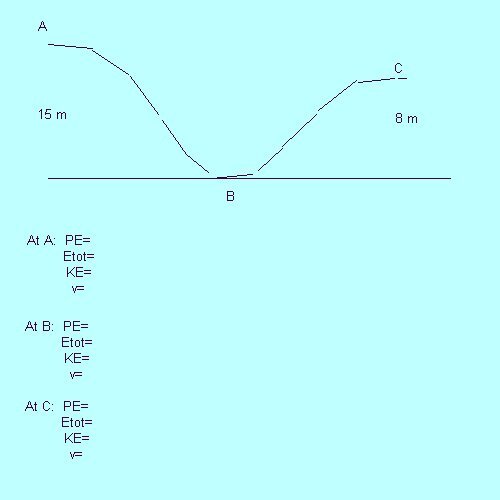 For the drawing shown, find the following at each point: The object's mass is 10 kg.